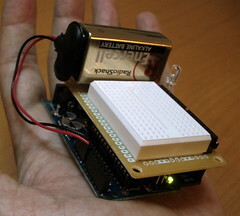 Do you think the concept of Arduino shields is just the coolest? 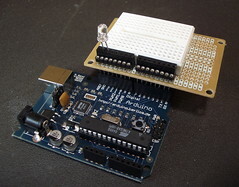 Do you wish you could get some of those neat Arduino Prototyping Shields that Tom Igoe made? Too bad no one sells them yet, because building your own versions of those boards is a bit out there for us ADD’ers. Don’t despair, there is a solution to the lack of breadboarduinos. 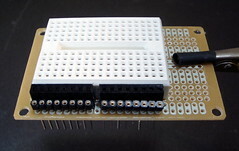 You can build your own Arduino shield with a solderless breadboard in about 10 minutes and 10 bucks. 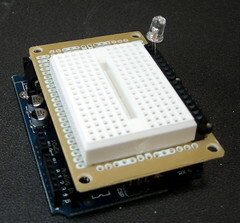 It’s not nearly as full-featured as Tom’s prototyping shields, but it’s great way to quickly add a solderless breadboard to Arduino. 1. Take the wire-wrap sockets and insert them into the furthest row of holes on the circuit board. Solder them down. 2. Insert the header sockets right next to the sockets. Solder them down. 3. Take the double-stick tape off the solderless breadboard and stick it on the circuit board next to the sockets. 4. Gently bend one row of wire-wrap pins a bit closer to the other set of wire-wrap pins. This is because the space between the two sockets on the Arduino board aren’t on a 0.1″ grid like the circuit board. Too bad for us. You may want to add a dab of hot glue to the opposite corner from where the sockets are to act as a bumper and keep the board level. Or you can use it “closed” like a normal shield, as in the picture up top. In this configuration, the analog and power jacks are still easily accessible, but the reset button and ICSP header are a bit hard to get to. Ah well, it was only 10 minutes of work.